ABJ and SJ have weighed in and voted for the fried rosettes (SJ will have to moderate the frying discussion), pizzelles and the snowflake cookies. 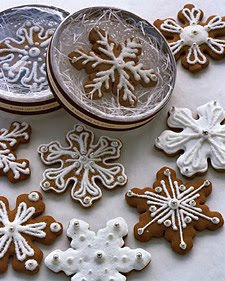 After I got their comments I went looking for the recipies and found that the snowflake recipe I used is really one for Swedish Papparkakor, which is why they are cardamom flavored (eat your heart out Martha, yours don't taste nearly as good). The frosting was inspired by Martha Stewart and I located some of the pictures. Just getting these delicate little guys out of the cookie cutter and onto the baking sheet is an art and the decorating takes at least an afternoon of pure dedication. The piping is never as straight as these are! The last time ABJ and I made these, which was around the time my father died 10 years ago, I think we gave up in exhaustion and left a dozen or so undecorated. The last time we made Pizzelles was at Windy Hill so ABJ was younger than 11. I found a recipe that describes how long you cook them - they go pretty fast but you have to have a watch with a second hand because you can only cook them for 30-40 seconds. If you don't get them out fast enough they are ruined. Lots of discards until we got the coordination just right. This is for the delicate and subtle Tea and Honey Crisps, made with Earl Grey tea leaves. Another recipe that requires two people working very fast to get the hot strips of cookie off the cookie sheet and hand twisted into just the right shape before they set.